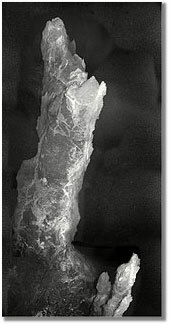 Hydrothermal vent structures serendipitously discovered last December in the mid-Atlantic Ocean, including a massive 18-story vent taller than any seen before, are formed in a very different way than ocean-floor vents studied since the 1970s. The findings are published by National Science Foundation (NSF)-funded researchers in the July 12 edition of Nature. This new class of hydrothermal vents apparently forms where circulating seawater reacts directly with mantle rocks, as opposed to where seawater interacts with basaltic rocks from magma chambers beneath the seafloor. "This discovery is a tremendous example of the results of targeted exploration of the ocean," says Margaret Leinen, NSF assistant director for geosciences. "We knew that the areas of great faults on the seafloor were interesting, but did not realize that hydrothermal activity of this sort could be taking place on seafloor generated millions of years ago." No one had previously seen a field quite like this, but Deborah Kelley, a University of Washington (UW) oceanographer and lead author of the Nature paper, says this kind of vent may be common on the seafloor. If so, scientists may have underestimated the extent of hydrothermal venting, the amount of heat and chemicals pouring into the world's oceans and the abundance of life that thrives in such conditions. "Rarely does something like this come along that drives home how much we still have to learn about our own planet," Kelley says. "We need to shed our biases in some sense about what we think we already know." The Lost City Field, named partly because it sits on the seafloor mountain Atlantis Massif, was discovered December 4, 2000, during an NSF-funded expedition led by Scripps Institution of Oceanography's Donna Blackman, UW's Kelley and Duke University's Jeffrey Karson. Blackman and Karson are among the paper's co-authors. Lost City is like other hydrothermal vent systems where seawater circulates beneath the seafloor and gains heat and chemicals until there is enough heat for the fluids to rise buoyantly and vent back into the ocean. As the warm fluids mix with cold seawater the chemicals separate from the vent fluids and solidify, sometimes piling up into impressive mounds, spires and chimneys of minerals. It was immediately clear, however, that the Lost City Field is unlike other hydrothermal vent systems in a number of ways. First, there is the height attained by some of the structures - the mighty 180-foot vent scientists named Poseidon compares to previously studied vents that reach 80 feet or less. The new vents are nearly 100 percent carbonate, the same material as limestone in caves, and range in color from a clean white to cream or gray, in contrast to black smoker vents that are a darkly mottled mix of sulfide minerals. And perhaps the Lost City's most distinctive feature is that it is sitting on 1.5 million-year-old crust formed from mantle material. In the area of the Lost City, spreading and faulting during the last 1 to 1.5 million years have stripped the mountain down to the underlying mantle rocks. Hydrothermal circulation appears to be driven by seawater that permeates into the deeply fractured surface and transforms olivine in the mantle rocks into a new mineral, serpentine, in a process called serpentinization. Kelley says it's easy to imagine there could be many more such systems. 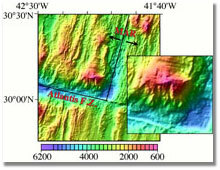 Within a mere 50-mile radius of the Atlantis Massif are three similar mountains subject to the same fracturing, the same intrusion of seawater and perhaps the same reactions with mantle material. And those four represent only a tiny fraction of the potential sites along the 6,200 mile Mid Atlantic Ridge, as well as the Indian ridges and the Arctic Ridge, also considered slow- and ultraslow-spreading centers. A 5-foot-wide flange, or ledge, on the side of a chimney in the Lost City Field is topped with dendritic carbonate growths that form when mineral-rich vent fluids seep through the flange and come into contact with the cold seawater. A larger version (53kb) is here. Collecting samples from a 6-foot-wide flange, or ledge, growing from the side of the 18-story carbonate chimney in the Lost City Field reveals an opening into the hollow white interior of the flange from which warm vent fluids escape in a shimmering curtain. A larger version (64kb) is here. 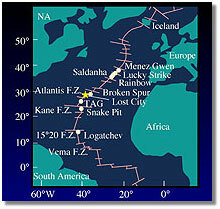 The Atlantis Massif is west of the Mid-Atlantic Ridge and north of the Atlantis Fracture Zone. The Lost City Field is on a terrace on the side of the mountain, between 2,300 and 2,600 feet below the sea surface. A larger version (89kb) is here. The Mid-Atlantic Ridge is one of the earth's largest undersea mountain ranges at a length of nearly 6,200 miles. The dots represent active hydrothermal sites. A larger version (45kb) is here. The carbonate structures at the Lost City Field include this chimney more than 30 feet in height. The white, sinuous spine is freshly deposited carbonate material. The top shows evidence of collapse and re-growth, as indicated by the small newly developed cone on its top. A larger version (146kb) is here. 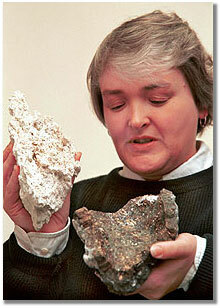 University of Washington oceanographer Deborah Kelley contrasts the white porous (almost wasp-nest-like) texture of a sample from the Lost City's carbonate chimneys with a sample from the sulfide chimneys studied since the 1970s. A larger version (115kb) is here. NSF is an independent federal agency which supports fundamental research and education across all fields of science and engineering, with an annual budget of about $4.5 billion. NSF funds reach all 50 states, through grants to about 1,800 universities and institutions nationwide. Each year, NSF receives about 30,000 competitive requests for funding, and makes about 10,000 new funding awards. Receive NSF publications and reports through the email- and web- based alert service, Custom News. To subscribe, go to http://www.nsf.gov and click on "Custom News Service."